We're at the beginning of the second quarter of 2019! Time is flying by. Our #EattheWorld project, being spearheaded by Evelyne of CulturEatz, is a lively group of adventurous cooks and eaters. You can read more about the challenge. And this month she has us traveling by tabletop to Mexico. Well, being a resident of California, we have access to lots of Mexican produce and products. 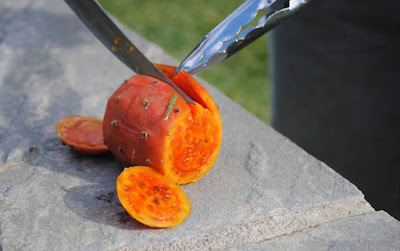 I made Prickly Pear Barbeque Sauce after raiding a friend's cactus. I even arranged for a Mole Making Class with a bunch of friends. I've been dreaming about Ruth Riechl's Cochinita Pibil since I went to The Foodie Edition a couple of years ago. You can read about that here. So, I decided to just do it...and I invited over some of our friends to join the fun. First, we took the boys to the park. Then we came back to the house and I put them to work, making tortillas. This crew spans ages preschool to high school and I have to say that I love watching these boys grow up and play together. And they are pretty darn handy in the kitchen, too. Cochinita Pibil, Ruth explained, was something that she learned in the Yucatan. It's a spice-rubbed pork cooked in banana leaves. This recipe was inspired by her story and watching her prep the dish on a stage; so there may be some spices that I missed. But I think this is close. One thing that struck me about her recipe: She toasted her banana leaves. I've used banana leaves in many dishes from - Filipino Suman to Honduran Nacatamales and from Ugandan Chicken Luwombo to Steamed Fish from Tuvalu - but I have always just used them as is. Frozen and defrosted. But watching her run the leaves over a flame was a new technique for me. And, I'm not joking, you could smell the aroma from the center of the theatre! As I said, I've always gotten the leaves frozen at the Filipino market. I found large, fresh banana leaves at the Mexican market last weekend. Wow! They were beautiful. I pulled out a culinary torch, sliced off the thick spine from the center, spread the leaves on a laundry rack, and put my Precise Kitchen Elf to work. I loved watching the color change and the leaves turn shiny as he ran the flame across the leaves. Put the spices - from the annatto seeds to the cloves - into a spice grinder; whirl to a powder. Place the garlic, shallots, vinegar, lime zest, lime juice, and salt in a food processor. Add in the spice blend and whirl until you have a thick paste. Massage the spice paste into the pork, cover, and refrigerate overnight. When you're getting ready to torch the banana leaves, remove the meat from the fridge. It should be room temperature. Line two Dutch ovens or other heavy lidded pans with banana leaves. Place 1 quartered onion in each pan. Place the pork in the center and drizzle with olive oil. Pour the stock over the top and fold the banana leaves around the pork, tucking the loose ends into the pan. Place the pan over medium to high heat and bring to a boil. You will have to listen as you want to keep it covered and not release the steam. Once you heat it boiling, reduce the heat to a simmer. Let the meat braise for 5 to 6 hours. To serve, place the entire banana leaf-wrapped packet on a platter. Let diners shred off as much meat as they want. Serve with picked red onions, picked carrots, homemade tortillas, rice, and beans. This sounds amazing. The recipe and the opportunity to watch Ruth Riechl in action.